WASHINGTON — Democrats in the House are set to unveil their own NASA authorization bill, which unlike a much leaner Republican proposal would authorize $18.1 billion in spending for 2014 — more than NASA has gotten since 2011. Compared with the draft proposal unveiled in late June by the Republican leadership of the House Science space subcommittee, the Democratic bill — to be put forth by ranking subcommittee member Rep. Donna Edwards (D-Md.) — would authorize more than $1 billion in additional NASA spending for 2014, according to an official summary of the bill obtained by SpaceNews. Edwards’ proposal is similar to the Republican bill in several ways: First, authorized funding for NASA’s Planetary Science Division would rise to about $1.5 billion in 2014, restoring the program to its 2012 level. Likewise, NASA’s Commercial Crew Program would be authorized for $700 million in 2014, exactly what the Republican bill proposes. The Democrat bill also contains strong support for NASA’s human spaceflight enterprise, which got top billing in the official summary of the bill Edwards is poised to introduce. Edwards said NASA should commit to human exploration of Mars by 2030, a more explicit directive than U.S. President Barack Obama made in 2010, when he canceled the Constellation moon exploration program and directed NASA to send humans to an asteroid by 2025 in preparation for manned Mars missions sometime in the 2030s. The similarities between the two bills end there, for the most part. 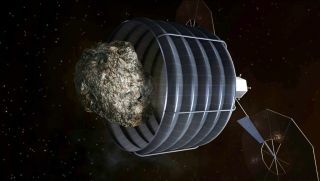 The Republican bill would ban an asteroid retrieval mission the Obama administration proposed in April and instead direct NASA to send more astronauts and hardware to lunar space. The Republican bill, which assumes NASA will be subject to across-the-board sequestration cuts for the foreseeable future, also called for shrinking NASA’s Earth science program and restructuring NASA management. The official summary of the Democratic bill mentions none of these things, and directs NASA to only one destination: Mars. The agency would be on the hook to draw up a 15-year Mars road map for Congress, under the Democrats’ bill, but it would be entirely up to NASA to decide whether the road to the Red Planet included detours to the moon, asteroids or Mars’ natural satellites. Edwards, who previewed her bill Monday (July 8) during a presentation at the Center for Strategic and International Studies here, said the Republican proposal keeps NASA tethered to legally mandated technical directives while at the same time choking off funding for crucial programs. “I don’t think [that’s] the way you do science, frankly,” said Edwards, the only speaker at the event. This story was provided by Space News, dedicated to covering all aspects of the space industry. Article on SPACE.com.